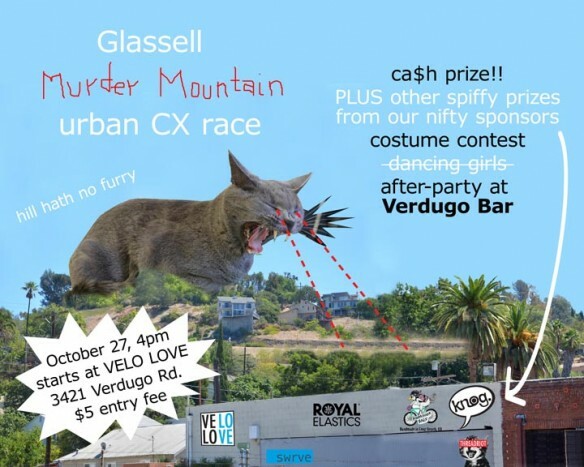 Alley cat race with some cyclocross to make things more fun and challenging for the racers!!! Get your legs ready!!! Thanks to New Belgium Brewery race includes two beer stops so make sure join the event if you will be attending so we will have enough beer on hand and don't forget to bring your ID! non-alcoholic option will also be available. the street at Verdugo Bar. Check out the poster for the amazing sponsors we've gotten!! 2 lap race will include a Le Mans start, 2 beer stops, 1-1/2 miles of dirt, 800 ft of climbing, some up to 20%, 188 stairs and more! Geared bikes encouraged, but not necessary. You will need tires that can go through dirt. Wearing a helmet is strongly encouraged! Be ready to ride through the dirt and do some epic climbing!! !